For other uses, see Oppido. An oppidum (plural oppida) is a large fortified Iron Age settlement. Oppida are associated with the Celtic late La Tène culture, emerging during the 2nd and 1st centuries BC, spread across Europe, stretching from Britain and Iberia in the west to the edge of the Hungarian plain in the east. They continued to be used until the Romans conquered Southern and Western Europe. In regions north of the rivers Danube and Rhine, such as most of Germania, where the populations remained independent from Rome, oppida continued to be used into the 1st century AD. In his Commentarii de Bello Gallico, Julius Caesar described the larger Celtic Iron Age settlements he encountered in Gaul during the Gallic Wars in 58 to 52 BC as oppida. Although he did not explicitly define what features qualified a settlement to be called an oppidum, the main requirements emerge. Size: The settlement has to have a minimum size, defined by Dehn as 30 hectares (74 acres). Topography: Most oppida are situated on heights, but some are located on flat areas of land. Fortification: The settlement is surrounded by a (ideally uninterrupted) wall, usually consisting of three elements: a facade of stone, a wooden construction and an earthen rampart at the back. Gates are usually pincer gates. In current usage, most definitions of oppida emphasise the presence of fortifications so they are different from undefended farms or settlements and from urban characteristics, marking them as separate from hill forts. They could be referred to as "the first cities north of the Alps". The period of 2nd and 1st centuries BC places them in the period known as La Tène. A notional minimum size of 15 to 25 hectares (37 to 62 acres) has often been suggested, but that is flexible and fortified sites as small as 2 hectares (4.9 acres) have been described as oppida. However, the term is not always rigorously used, and it has been used to refer to any hill fort or circular rampart dating from the La Tène period. One of the effects of the inconsistency in definitions is that it is uncertain how many oppida were built. In European archaeology, the term 'oppida' is also used more widely to characterize any fortified prehistoric settlement. For example, significantly older hill-top structures like the one at Glauberg (6th or 5th century BC) have been called oppida. Such wider use of the term is, for example, common in the Iberian archaeology; in the descriptions of the Castro culture it is commonly used to refer to the settlements going back to the 9th century BC. The Spanish word 'castro', also used in English, means a walled settlement or hill fort, and this word is often used interchangeably with 'oppidum' by archaeologists. The main features of the oppida are the walls and gates, the spacious layout, and usually a commanding view of the surrounding area. The major difference with earlier structures was their much larger size. Earlier hill forts were mostly just a few hectares in area, whilst oppida could encompass several dozen or even hundreds of hectares. They also played a role in displaying the power and wealth of the local inhabitants and as a line of demarcation between the town and the countryside. :25 According to Jane McIntosh, the "impressive ramparts with elaborate gateways ... were probably as much for show and for controlling the movement of people and goods as for defense". Size and construction varied considerably. Typically oppida in Bohemia and Bavaria were much larger than those found in the north and west of France. Typically oppida in Britain are small, but there is a group of large oppida in the south east; though oppida are uncommon in northern Britain, Stanwick stands out as an unusual example as it covers 350 hectares (860 acres). 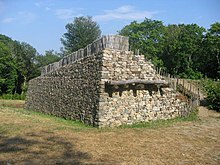 Dry stone walls supported by a bank of earth, called Kelheim ramparts, were characteristic of oppida in central Europe. To the east, timbers were often used to support the earthen ramparts, called Pfostenschlitzmauer (post slot wall) or "Preist-type wall". :25 In western Europe, especially Gaul, the murus gallicus, a timber frame nailed together, was the dominant form of rampart construction. Dump ramparts, that is earth unsupported by timber, were common in Britain and were later adopted in France. They have been found in particular in the north-west and central regions of France and were combined with wide moats ("Type Fécamp"). :25 Oppida can be divided into two broad groups, those around the Mediterranean coast and those further inland. The latter group were larger, more varied, and spaced further apart. In Britain the oppidum of Camulodunon (modern Colchester, built between the 1st century BC and the 1st century AD), tribal capital of the Trinovantes and at times the Catuvellauni, made use of natural defences enhanced with earthworks to protect itself. The site was protected by two rivers on three of its sides, with the River Colne bounding the site to the north and east, and the Roman River forming the southern boundary; the extensive bank and ditch earthworks topped with palisades were constructed to close off the open western gap between these two river valleys. These earthworks are considered the most extensive of their kind in Britain, and together with the two rivers enclosed the high status farmsteads, burial grounds, religious sites, industrial areas, river port and coin mint of the Trinovantes. Prehistoric Europe saw a growing population. According to Jane McIntosh, in about 5,000 BC during the Neolithic between 2 million and 5 million people lived in Europe; in the late (pre-Roman) Iron Age (2nd and 1st centuries BC) it had an estimated population of around 15 to 30 million. Outside Greece and Italy, which were more densely populated, the vast majority of settlements in the Iron Age were small, with perhaps no more than 50 inhabitants. While hill forts could accommodate up to 1,000 people, oppida in the late Iron Age could reach as large as 10,000 inhabitants. Oppida originated in the 2nd and 1st centuries BC. Most were built on fresh sites, usually on an elevated position. Such a location would have allowed the settlement to dominate nearby trade routes and may also have been important as a symbol of control of the area. For instance at the oppidum of Ulaca in Spain the height of the ramparts is not uniform: those overlooking the valley are considerably higher than those facing towards the mountains in the area. The traditional explanation is that the smaller ramparts were unfinished because the region was invaded by the Romans; however, archaeologist John Collis dismisses this explanation because the inhabitants managed to build a second rampart extending the site by 20 hectares (49 acres) to cover an area of 80 hectares (200 acres). Instead he believes the role of the ramparts as a status symbol may have been more important than their defensive qualities. While some oppida grew from hill forts, by no means all of them had significant defensive functions. The development of oppida was a milestone in the urbanisation of the continent as they were the first large settlements north of the Alps that could genuinely be described as towns. :29 Caesar pointed out that each tribe of Gaul would have several oppida but that they were not all of equal importance, perhaps implying some form of settlement hierarchy. Oppida continued in use until the Romans began conquering Iron Age Europe. Even in the lands north of the River Danube that remained unconquered by the Romans, oppida were abandoned by the late 1st century AD. In conquered lands, the Romans used the infrastructure of the oppida to administer the empire, and many became full Roman towns. This often involved a change of location from the hilltop into the plain. Staré Hradisko Population estimate 5,000. Oppidum Závist [cz], 170 ha. Population estimate 3,400. See reconstructed model of the acropolis in 450 BC. ^ "Ancient Europe 800 B.C-A.D 100" (PDF). ^ a b c d e f g h i Rieckhoff, Sabine; Fichtl, Stephan (2011). Keltenstädte aus der Luft/AID Sonderheft Plus (in German). WBG. ISBN 978-3-8062-2242-5. ^ a b "Reconstruction of the Duensberg" (PDF). ^ Krivanek, Jaroslav. "CGG Project: Virtual reconstruction of Celtic sites on the territory of the Czech Republic". cgg.mff.cuni.cz. Cunliffe, Barry & Rowley, Trevor (eds.) (1976) Oppida, the Beginnings of Urbanisation in Barbarian Europe: Papers Presented to a Conference at Oxford, October 1975. British Archaeological Reports. Oxford: Archaeopress.